New York State Senator John Bonacic (R-District 42) has been serving in Albany since 1990. An experienced politician with that sort of tenure knows there’s an easy way and a hard way to get things done. On Tuesday, Bonacic went with the easy way. During a meeting by the New York Senate Racing, Gaming and Wagering Committee that lasted less than four minutes, Bonacic, who also chairs the committee, swiftly moved six pieces of legislation including his own bill to legalize online poker. S5302B would permit the issuance of up to 10 Internet poker licenses at a cost of $10 million each, with gross poker revenues being taxed at 15 percent. 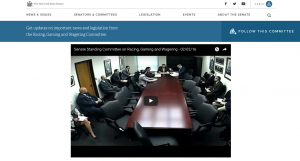 The iPoker bill was the fourth measure Bonacic brought up on Tuesday, and after asking whether there were any questions on the statute and there were none, he referred the legislation to the Senate Finance Committee. Nine committee members voted in favor of S5302B, two voted in favor with reservations, and zero voted against. Bonacic has been trying to pass online poker for nearly two years, but he’s made little progress. In fact, his previous bill to legalize iPoker, S6913 and its amended S6913A, failed to ever reach the floor of the state senate. During that 2013-2014 legislative cycle, the bill was also referred to the Senate Finance Committee for approval where it was ultimately shelved. Bonacic is hoping the second time’s a charm. Aside from a unanimous vote on the bill, Bonacic’s chances of finally seeing success in 2016 has added odds due to six Senate Racing, Gaming and Wagering Committee members also serving on the Finance Committee. Bonacic himself is one of those six. Of the 37 Finance Committee members, 21 are part of the Republican Party. Though gambling expansion has never been a conservative principle, it’s favored over any such tax increase, which is perhaps the most core pillar of the modern GOP. Poker Players Alliance (PPA) Executive Director John Pappas wasted no time in celebrating the news out of the country’s fourth-largest state. The Empire State is hinting that it is ready to shove all-in against online gambling in 2016. New York State Attorney General Eric Schneiderman is perhaps the country’s most outspoken critic of daily fantasy sports (DFS) and plans to meet DraftKings and FanDuel in court in the coming months. In a New York Daily News November op-ed, Schneiderman linked DFS to online poker. Bonacic hopes to convince the members of the state legislature that online poker should be authorized because it’s a game of skill. He isn’t alone, as State Assemblyman J. Gary Pretlow (D-District 89) is working hard in the other chamber to persuade his colleagues.